Mutations in mitochondrial tRNA genes have been widely reported association with human reproductions. It is also important to explore the effect on the number of piglets born alive (NBA). Here, 1017 sows were used to investigate the association between polymorphisms in mitochondrial tRNA genes and NBA. In total, 16 mutations were found in mitochondrial tRNA genes, of which 13 mutations were significantly associated with NBA (P < 0.05). The reproductions of mutant carriers were significantly greater than that of wild carriers by 0.989 piglets born alive/sow farrowing. To test whether the mutations altered the structure of mitochondrial tRNAs, the secondary and tertiary structures were predicted. In result, C2255T changed the secondary structure of tRNA-Val by elongating the T stem and shrinking the T loop, and C2255T and G2259A in the tRNA-Val gene, C6217T and T6219C in the tRNA-Ala gene, and T15283C in the tRNA-Glu gene altered the tertiary structure of their tRNAs, respectively by changing the folding form of the T arm, and C16487T in the tRNA-Thr gene changed the tertiary structure of mitochondrial tRNA-Thr by influencing the folding form of the acceptor arm. Results highlight the effect of mitochondrial tRNA genes on the number of piglets born alive, and suggest that polymorphic sites of the tRNA genes be genetic markers for selection of pig reproduction. Mitochondria participate in several important cellular processes, including apoptosis, signaling, metabolic homeostasis and biosynthesis of macromolecules such as lipids and heme . Beyond these functions, mitochondria are the indispensable organelle capable of synthesizing approximately 90% of cellular ATP in vertebrates. They contain a class of cytoplasmic DNA molecules, i.e., mitochondrial DNA (mtDNA). The mammal mitogenome encodes 13 polypeptides, 22 transfer RNAs (tRNAs) and 2 ribosomal RNAs (rRNAs) . The 13 essential complex subunits responsible for oxidative phosphorylation (OXPHOS) are translated by the mitochondrial separate protein synthesis machinery, which uses the 22 species of mitochondrial tRNAs (mt-tRNAs) [3, 4]. In the process of gene translation, a molecule of tRNA must be bound with the appropriate amino acid, which largely depends on the structure of the tRNA. The tRNA is canonically folded into the cloverleaf secondary structure, which is characterized by four double helical regions, the acceptor (A) stem, the dihydrouridine (D) stem and loop, the anticodon (C) stem and loop, and the TφC (T) stem and loop. These stems are composed of seven, four, six, and five base pairs, respectively. Some tRNAs contain a fifth stem-loop named extra arm, which is located in the RNA sequence between the anticodon stem and the T stem . It is further folded into the tertiary structure, the inverted L-shape, which is stabilized by various tertiary interactions between the D- and T-loops, and interactions of the variable region with the D-stem-loop . The L-shape can amplify the effect of the two active ends: the anticodon and the acceptor stem in a simple way . However, mt-tRNAs have a noncanonical secondary structure and a number of them have strong structural deviations from cytoplasmic tRNAs. Almost all tRNAs-Ser for AGY/N codons lack the D-arm, and in some nematodes, no four-armed cloverleaf-type tRNAs are present: two tRNAs-Ser without the D-arm and 20 tRNAs without the T-arm are found . Therefore, mt-tRNAs are considered as “bizarre” tRNAs [4, 8]. The mt-tRNA genes are highly susceptible to point mutations, which is a primary cause of mitochondrial dysfunction and thus leads to a few of human pathologies . Numbers of researches revealed that the mutations in mt-tRNA coding genes could result in the failure of metabolism [9–12], such as T4395C in tRNA-Gln, G5821A in tRNA-Cys, A7543G in tRNA-Asp, T10454C in tRNA-Arg, A14693G in tRNA-Glu, C7492T in tRNA-Ser and A3302G in tRNA-Leu. The mutation, A3302G located at the acceptor arm of tRNA-Leu, caused the dysfunction via reducing the mitochondrial copy number . In particular, the mitochondrial T7719G and A7755G mutations in the tRNA-Lys gene affected litter size in Small-tailed Han sheep and Afec-Assaf flocks, respectively [13, 14]. Nevertheless, similar reports on the genetic effect of mt-tRNA genes on pig reproduction are absent. In this study, we explored the polymorphism of mt-tRNA genes, their impacts on the secondary and tertiary structures of mt-RNAs, and the correlation between them and the number of piglets born alive (NBA). In total, 1017 sows with 2170 records on litter size were used in this study. The pigs were from commercial breeds (Duroc, Landrace and Yorkshire) at two farms (Wangzu Pig Breeding Inc. in Xingtai, Hebei Province, and Liuma Pig Breeding Inc. in Beijing, China) and from 11 maternal lineages. There were overlaps between breeds and maternal lineages. There were 3 breeds in each of the three maternal lineages (M2, M3 and M8), 2 breeds in each of the two lineages (M1 and M11), and only one breed in each of other six lineages, as detailed in Table 1. There were gene flows among the three breeds at least in the maternal lineage. To improve the efficiency of significance testing, we used the mixed population of three breeds. The pig information, including the farm, farrowing year and season, breed, parity number, service boar, were listed in the Additional file 1: Table S1. The samples were from the ear-tag or blood tissue of the pigs. To analyze mtDNA polymorphisms, we first extracted genomic DNA using the standard phenol/chloroform method . The mitochondrial DNA was PCR-amplified using 16 primer pairs described in Additional file 1: Table S2. Subsequently, PCR products were sequenced in the Sanger method. We compared the resultant data with the Sus scrofa complete mitochondrion sequence (GenBank Accessible No. NC_000845.1) to identify the mtDNA variants. MEGA6  and DnaSP v5  were used to assemble the mitogenome. Association analyses were performed between the number of piglets born alive and polymorphic sites within the mitochondrial tRNA, rRNA and polypeptide coding genes, and the D-loop region, by a linear mixed model approach. For each SNP, the Wald chi-squared statistic was used to examine whether the SNP was associated with the trait. The method was similar to that of Chen et al. and carried out by ASReml . The number born alive (response variable) was adjusted for the pig farm, farrowing year-season, breed, parity number, and service boar. In addition, the genetic background was considered based on the pedigree data. The false discovery rate (FDR) correction method in the R project (R version 3.2.5)  was used to control the rate of false-positive rates. We regarded the adjusted P < 0.05 as statistical significance. To test whether the point mutation affected the mt-tRNA structure, the tRNAscan-SE 2.0  was applied to predict the secondary structure with or without the remarkable mutations, under the ‘default’ search mode, with the vertebrate mitochondrial genetic code and ‘vertebrate mitochondrial’ source. The tertiary structures were sequentially predicted by RNAComposer with default parameters [19, 20]. A total of 16 vertebrates’ mtDNA sequences were used in the interspecific conservation analysis. These included: Sus scrofa (NC_000845.1), Sus celebensis (NC_024860.1), Phacochoerus africanus (NC_008830.1), Bos Taurus (KF926377.1), Bos indicus (JN817298.1), Bos grunniens (KU891851.1), Bos frontalis (MF614103.1), Bubalus bubalis (KX758400.1), Ovis Aries (AF010406.1), Capra hircus (KP273589.1), Camelus bactrianus (NC_009628.2), Cervus elaphus (NC_007704.2), Leopardus guigna (NC_028321.1), Canis lupus (KT901460.1), Homo sapiens (NC_012920.1) and Mus musculus (KF937873.1). The conservation index (CI) was calculated by comparing the pig nucleotide variants with another 15 vertebrates, and defined as the percentage of species from the list of 15 vertebrates with the wild-type nucleotide at that position. Notably, the CI ≥ 70% is considered as high conservation . To see the potential association between mtDNA and the number of piglets born alive, we screened the mtDNA variants in matrilineal relatives from the 11 families. PCR-Sanger sequencing led us to identify 232 mtDNA variants, listed in Table 2 and Additional file 1: Table S3. Among these, 16 variants located at nine mt-tRNA genes, including three polymorphic sites in each of tRNA-Phe and tRNA-Ala, two sites in each of tRNA-Val, tRNA-Leu(UAG) and tRNA-Thr, and one site in each of tRNA-Cys, tRNA-Asp, tRNA-Gly and tRNA-Glu. Association analyses were performed to evaluate the correlation between the mtDNA variants and the number of pigs born alive. Thirteen polymorphic sites in mt-tRNA genes significantly affected NBA (P < 0.05), including the A1225G and T1236C mutations in the tRNA-Phe gene, the C2255T and G2259A mutations in tRNA-Val, the C6217T and T6219C mutations in tRNA-Ala, T6429C in tRNA-Cys, T10601C in tRNA-Gly, A12879G and C12883T in tRNA-Leu(UAG), T15283C in tRNA-Glu, and C16487T and G16531A in the tRNA-Thr genes. The reproductions of mutant carriers were significantly greater than that of wild carriers by 0.989 piglets born alive/sow farrowing (Table 3). Furthermore, these notable mutations were assembled into haplotypes, and then the pigs were clustered into two haplotypes, which were also significantly associated with NBA (P = 0.039 < 0.05). On the contrary, the association study proposed that the polymorphic sites in the D-loop region and the rRNA and polypeptide coding genes were not involved in NBA (Table 2). According to the tRNAscan-SE 2.0, all of the tRNAs were folded into the cloverleaf secondary structure, displayed in Fig. 1 and Additional file 2: Figure S1. 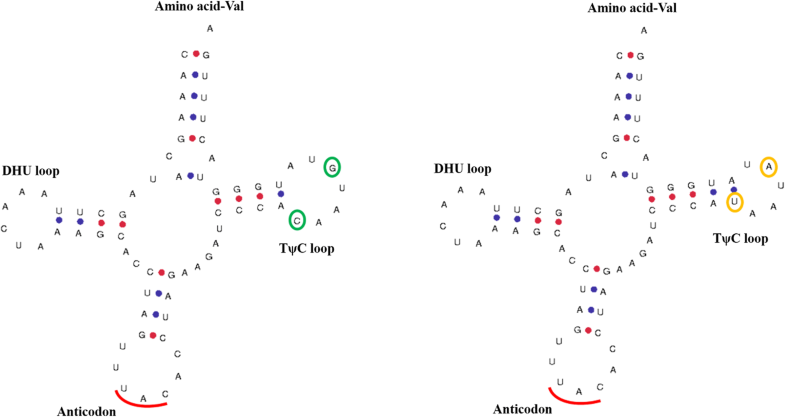 Of the 16 mutations, two sites located at the A stem of the tRNAs, four sites were in the D loop, three sites occurred in the T stem, and seven sites were situated in the T loop, detailed in Table 4. Remarkably, the mutation C2255T changed the secondary structure of tRNA-Val by elongating the T stem and shrinking the T loop. Fifteen non-Watson-Crick base pairs, which could be key for the three-dimensional structure of the tRNAs, were identified. Eleven of them were U-G unmatched base pairs, scatteredly distributed in the A, C, D, and T stem, and the others were A-A, A-C, C-C and C-U pairs, situated in the A stem (Tables 5 and 6). The tRNAs were then all folded into the L-shaped tertiary structure, showed in Fig. 2, Additional file 2: Figure S2 and Additional file 3. Notably, the C2255T and G2259A mutations affected the tertiary structure of tRNA-Val by changing the folding form of the T arm, so did C6217T and T6219C in tRNA-Ala and T15283C in tRNA-Glu. The C16487T in tRNA-Thr changed the folding form of the acceptor arm. To see whether these mt-tRNA mutations were conservative, we calculated the conservation index for each mutation. We found that the A1225G, T1236C and C6217T mutations exhibited high levels of CI (CI ≥ 70%), while the other 10 mutations had low levels of conservation (CI < 70%) (Table 7). Mitochondrial mutations result in changes in oxidative phosphorylation enzyme complexes . Since 1988, when the first pathogenic mitochondrial mutations were reported, an increasing amount of mtDNA mutations associated with a wide variety of clinical diseases have been identified [23–26]. To date, MITOMAP has featured more than 600 different pathogenic mutations in the mitochondrial genome . Almost half of the mutations are located in mitochondrial tRNA coding genes, a remarkable trend, given that their sequences comprise only 10% of the mitogenome. In this study, 16 polymorphic sites were observed in 9 mt-tRNA genes, and more than 81% of them significantly affected NBA (P < 0.05), located in the tRNA-Phe, tRNA-Val, tRNA-Ala, tRNA-Cys, tRNA-Gly, tRNA-Leu(UAG), tRNA-Glu, and tRNA-Thr genes, respectively. The distribution of the mutations among mt-tRNA genes was widespread, concordant with that of pathogenic mutations in human mitochondria . These mutations displayed a low level of conservation, 77% of them with CI lower than 70%. Transfer RNAs in animal mitochondria diverge too much in sequence among species to make comparisons and find out homologous functions from related species . But several mitochondrial tRNA point mutations indeed associated with reproductive traits have been reported. The A3243G mutation in the tRNA-Leu (UUR) gene was associated with sperm motility . Our study uncovered other two mutations in the tRNA-Leu(UAG) gene of great importance to reproduction. In addition, A7755G and T7719G in tRNA-Lys affected litter size in Afec-Assaf and Small-tailed Han sheep flocks, respectively [13, 14]. There were also mitochondrial genetic effects on sperm structure , asthenozoospermia , spermatozoa fertility  and oocyte senescence . These consequences, consistent with our results, proposed the effect of mt-tRNA genes on reproduction, and suggested that tRNA polymorphic sites be genetic markers for selection on pig reproduction. Mitogenomes are subject to a high genetic drift, while D and T arms are the places where evolutionary drift is allowed to occur . In the study, base substitutions mainly occurred in D and T arms of tRNAs. 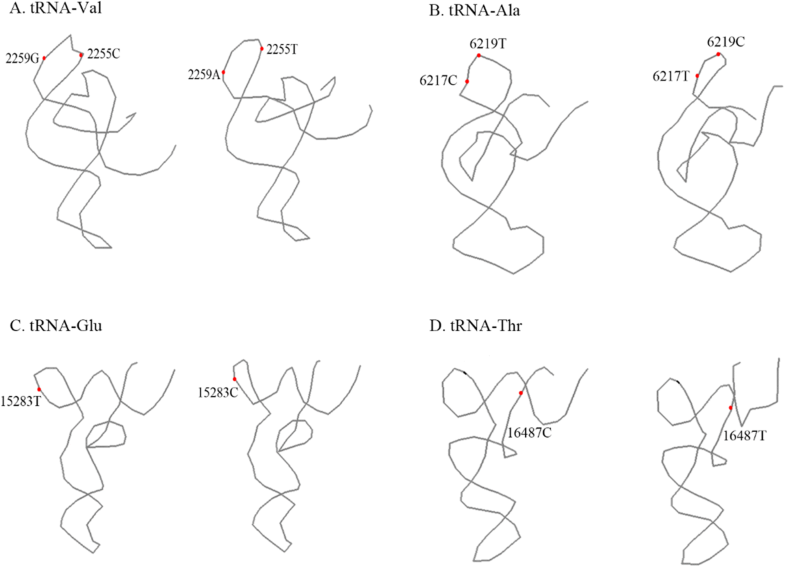 All tRNAs have a global cloverleaf structure with restricted size variations, consistent with the published human mt-tRNA 2D structures . The C2255T mutation changed the length of stem-loops, i.e. it elongated the T stem and shrank the T loop of tRNA-Val (Fig. 1), and made the L-shaped tertiary structure a little different, showed in Fig. 2. Additionally, the C6217T and T6219C mutations in tRNA-Ala and the T15283C mutation in tRNA-Glu affected the tertiary structure by changing the folding form of the T arm, and C16487T in tRNA-Thr changed the folding form of the acceptor arm (Fig. 2). A molecule of tRNA must be bound with the appropriate amino acid by aminoacyl-tRNA synthetase (aaRS) before translation occurs, which is related to ATP and the structure of tRNA . The discovery of diseases correlated with mt-tRNA mutations provided that the effect could be traced to the destabilization of structure that destroys the native fold required for all aspects of function. The base substitutions were likely to have an impact on mt-tRNA conformation of the secondary and tertiary structures . The other mutations in tRNAs didn’t change the structure conformation, and might influence translation by the paracodon. The paracodon is the second genetic code located on tRNAs identified by aaRS during translation phase of protein synthesis . It is a simple structural feature, but a major determinant for establishing the identity of this tRNA . The accuracy of a translation process depends on two successive independent matchings: amino acids matching with tRNAs; charged tRNAs matching with ribosome-linked mRNA. The latter is direct interaction between the anticodon and the codon . The anticodon is the sequence of three adjacent nucleotides in tRNA binding to the corresponding codon and designating a specific amino acid during protein synthesis, and its mutation will be fatal, thus few changes can be preserved through evolution. However, the former depends mainly on the paracodon, which is critical. Each aaRS has a binding site for an amino acid, and another for the tRNA specific for that amino acid. Transfer RNA acts as a kind of link between the information encoded in the mRNA and the amino acid. The paracodon could not include the anticodon but may be as little as a single base pair in several instances [37, 39, 40]. Only a few paracodons have been identified for some species. Alanine specificity depended on G3 U70 in the acceptor stem of tRNA-Ala for the Escherichia coli . tRNA-Leu could be converted to tRNA-Ser by 12 nucleotide replacements, not involving the anticodon . Nucleotides in the T stem may contribute to the structure and stability of functional tRNAs . In addition, the mutations in mt-tRNAs might also affect the chemical modification. RNA modifications are a regulatory layer on top of the primary RNA sequence , which are particularly enriched in tRNAs and critical for all aspects of tRNA functions, including folding, stability, and decoding. It was reported that loss of chemical modifications could reduce protein production or translational accuracy. It was often linked to human diseases, ranging from metabolic defects, neurological disorders to cancer [44, 45]. There are two mitochondrial-linked diseases associated with aberrant mt-tRNA modifications: mitochondrial myopathy, encephalopathy, lactic acidosis, and stroke-like episodes (MELAS) and myoclonus epilepsy associated with ragged-red fibers (MERRF) [46–48]. Nucleotide substitutions in mitochondrial tRNA genes have a large probability to obstruct the chemical modification of mt-tRNAs and thus explain the litter size effect. No substitution occurred in the anticodon nucleotides, and the polymorphism in polypeptide coding genes had little effect on NBA. It’s reasonable because one mutation may affect DNA decoding, and subsequently leads to dysfunction of cell growth. We also evaluated the Grantham score based on the chemical properties of the amino acid side-chains , and found some clues that more than 91% of the amino acids were similar in chemical properties before and after variation, which resulted in little impact on NBA. In conclusion, we investigated the correlation of mitochondrial DNA polymorphisms to the number of pigs born alive, and predicted the secondary and tertiary structures of mt-tRNAs. The present study uncovered the significant associations between 13 mt-tRNA polymorphisms (A1225G, T1236C, C2255T, G2259A, C6217T, T6219C, T6429C, T10601C, A12879G, C12883T, T15283C, C16487T and G16531A) and number born alive, and the genetic effect can reach 0.989 piglets, which is potentially useful for selection of pig reproduction. Dan Wang and Chao Ning contributed equally to this work. We thank Wangzu Pig Breeding Inc. in Xingtai, Hebei Province, and Liuma Pig Breeding Inc. in Beijing, China for help with samples. This work was supported by the National Key Basic Research Program of China (2014CB138500) and the National Natural Science Foundations of China (31672379 and 31661143013). All experimental pigs were maintained under the standard farm management practices according to the guidelines of the experimental animal management of China Agricultural University (CAU), and the study was approved by the Experimental Animal Care and Use Committee of CAU. Samples were collected followed the guideline of Animal Ethical Committee of China. M L. MITOMAP: a human mitochondrial genome database. http://www.mitomap.org. Accessed 14 Sep 2018. Schimmel P. Similarities in the structural organization of complexes of tRNAs with aminoacyl-tRNA synthetases and the mechanism of recognition. Cold Spring Harbor Monograph Archive, North America, 09A, jan. 1979. Available at: http://cshmonographs.org/index.php/monographs/article/view/3349. Accessed 25 Oct 2018.